FinCEAL Plus LAC again organized and supported a Finnish delegation to attend FAUBAI 2018. FAUBAI is a yearly conference organized by the Brazilian Association for International Education, and it is considered to be the most important event on internationalization of higher education in South America. Based on the positive experiences gained at FAUBAI2016, FinCEAL Plus LAC again organized and supported a Finnish delegation to attend FAUBAI 2018. FAUBAI is a yearly conference organized by the Brazilian Association for International Education, and it is considered to be the most important event on internationalization of higher education in South America. 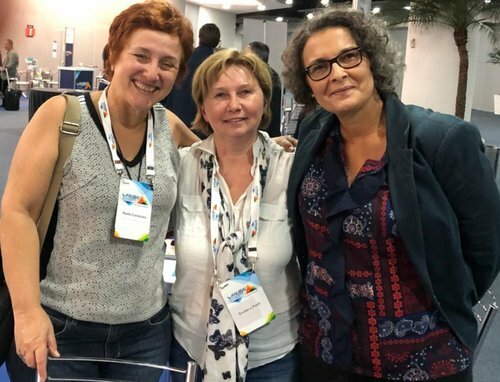 The 30th Annual Conference FAUBAI 2018 was held in Rio de Janeiro fromApril 14 to 18, and brought together nearly 800 representatives from 29 different countries involved in the internationalization of higher education. The general theme this year was "Internationalization and Research:Challenges and Strategies” and discussions focused on issues related to the implementation of comprehensive internationalization policies, the attractiveness of Brazilian research and Brazil as a destination for international students and researchers, among other topics. Finland had a stronger presence at the event than everbefore. The delegation supported by FinCEAL Plus consisted of representatives of Aalto University, Häme University of Applied Sciences, University of Tampere, University of Turku and Åbo Akademi. Jarkko Wickström, ‎Coordinator for Education and Science Cooperation at the FinnishEmbassy in Brazil provided on-site support for the Finnishgroup. Besides a joint info table thatattracted Brazilian participants to discuss cooperation matters, several Finnish HEI’s also held presentations in the various sessions organized during the conference, which provided more visibility for the Finnish institutions present. Having a joint delegation and a shared table proved to be a recommendable approach this time as well. This years' delegates recommend Finnish HEI's to actively propose presentations for the conference program also in the coming years. Many delegates visited their partner universities inRio, or had one-on-one meetings with them during the conference. For future reference, participants recommend contacting key people and agreeing on meetings in advance. Finding the right individuals in the crowd is difficult, as there is no big exhibition area where different institutions would be easily identifiable. Also several new agreements between Finnish and Brazilian HEI’s were planned, which will hopefully soon lead to new student exchanges, for example. Carrying out the necessary "homework” and follow-up after the event is clearly a must for operationalizing the new partnerships that were established. When it comes to internationalization in Brazil, a lotis happening. According to Jarkko Wickström, the next five years will determine the direction of the internationalization of higher education in the country. Thecontact networks formed now are of critical importance for forming lasting partnerships with the best local institutions. Finnish HEI’s need to invest in the creation and maintenance of these networks and partnerships, and active FAUBAI attendance is one key action in strengthening Finnish visibility and awareness of Finnish expertise in Brazil. The next FAUBAI Conference will be held in Belém, the capital of the state of Pará from April 13 to 17, 2019. More information will be published later on the FAUBAI website. Text: Kajsa Ekroos, FinCEAL Plus LAC, with special thanks to Taina Honkavuori, Cataldo de Blasio, KirsiKorpela, Niina Huovinen, Salla Atkins, Svetlana Pasti and Jarkko Wickström for their input forthe article. Picture credits: Taina Honkavuori, HAMK (first two pictures) and Svetlana Pasti, University of Tampere (last picture).